So we’ve gone through deck-building techniques, Dominion techniques, and finally specific Dominion card terms. So what’s next? I know you all are hoping I’m going to write about attack cards so you can smash your opponents to bits gloriously. Well, that’s not it. You’re just going to have to wait on that one. In this edition of Stacking the Deck, I’m actually going to make up some terms of my own to apply to some common combinations of terms and describe how they effect your deck. Understanding what these mean will help you judge more quickly which cards should be added to your deck and when. This actually sounds negative, but these cards are great. I call them “empty” because they don’t take up space in your deck—as long as you don’t draw them on a dead +Cards draw with no actions left. Remember, a +1 Card gets you the card that you would have had if this card wasn’t in your deck, and the +1 Action assures that you will be able to play at least one more action card if you need to. A card that is simply +1 Card and +1 Action alone is pretty worthless. While it doesn’t take up space in your deck, it doesn’t do anything to make your deck better, so what you really need to look at is the additional effects the card provides. That additional effect is what you should judge the value of the card by. Some of these are great. Some don’t do a whole lot. For example, the Village card. You’ve got the +1 Card, +1 Action, so it counts as an empty card, leaving the additional +1 Action as the real benefit. What does that do? Well, obviously, it lets you play more action cards. What does it mean? Well, it means you can buy action cards more liberally, including dead action cards, and still likely be able to play them. But you need to balance that with how many Villages you have, in both ways. A Village early on doesn’t help your deck at all—you don’t have enough action cards to worry about running out of actions, and there’s no other benefit to your deck. Whereas if you have a lot of action cards, more Villages will ensure that you can play them. So when looking at +1 Card/+1 Action cards, make sure to measure its worth to your deck by what else it provides. It needs to actually make your deck better in some way. A certain number of cards (mostly variations on the Village—Walled Village, Fishing Village, Mining Village, City, etc.) give +2 actions, allowing you to string multiple dead-end actions together. It’s a great way to feel safe playing that Smithy or Council Room without worrying about drawing valuable action cards. Look at all those tasty Actions. +2 Actions is pretty useful by itself, but again, too many of these will end up being useless unless either you have a lot of other kinds of action cards or the card also confers another benefit, such as drawing cards, bonus coins, or extra buys. You always need to balance these with other actions, though, as they will never alone be enough to win. Festival is super with its +2 actions, +2 treasure, and +1 buy, but since it doesn’t draw new cards or offer any other way to increase your hand power or bypass victory cards, you need something else to bolster its effectiveness. These cards are useful but should never be the core of your strategy. Pair them with something else to balance it out. There are a lot of variations on the “Village” theme. These cards are especially designed to make your next hand awesome. The quintessential example is Seaside’s Tactician, which lets you drop your current hand in exchange for a double turn the next time around. However, there are a number of variations on this. One of my favorites—the Scout (from Intrigue)—is a subtle way to affect your next hand by removing all the victory cards from the next four cards in your deck. Even if you can’t use the rearranging factor because you don’t have any +Card actions in hand, you still clear out a lot of the bad stuff for your next hand. Hand prep is an extremely useful tool if used carefully. Duration cards are obvious hand-prep. Seaside has a lot of hand prep. But hand prep cards should be used sparingly. Remember, no matter how much you try to prep your next hand, you still need those golds and +Buys and everything else to make it count. You can prep til your eyes bleed, but if you only have copper, your hands will never be any good. Hand prep cards are often the most confusing cards to figure out the long-term benefit of. If you’re not sure why someone would ever want a certain card in their deck, chances are it’s hand prep. Cards that give you a big bonus but require discarding or placing cards back on your deck are hand prep cards. Something to consider when you play cards like Courtyard or Mandarin – you should put back the best possible card you can afford, to maximize your next hand. You don’t need to keep that Gold if you have enough treasure to afford what you want to buy next. This is also a great way to put away an action card that you can’t use this turn. You can do amazing things with careful use of these cards. 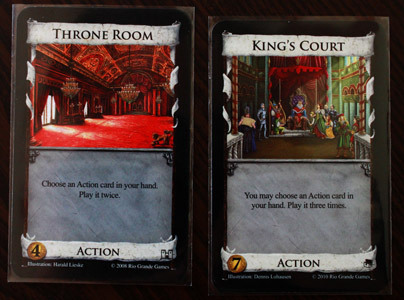 Okay, so far, there are actually only two of these cards: Throne Room (from the base game) and Prosperity’s Kings Court. These are obviously powerful cards that are often misused. The obvious use of these cards is to double (or triple) the effectiveness of a card. Obviously. Who doesn’t love playing a card twice for all the extra card draws or treasure? However, you can also use these to effectively gain more actions when played well. The initial and obvious strategy is to Throne Room any card that gives +1 Action, because you effectively get two extra actions, freeing up more playing power. However, perhaps less obvious, is the Throne Room of a Throne Room when no +Actions are available at all. When you Throne Room a Throne Room, obviously you play the second Throne Room twice—which means you pick two action cards to play twice instead of one. While this is effectively the same as Throne Rooming each card separately, you can do it this way if you only have one action. The trick is, it’s only worthwhile if you have enough action cards to play. Duplicators are also great with Intrigue cards—remember, you’re not just “doubling” the card, you’re playing it twice. That means when a card has a choice (like many Intrigue cards do), you can make different choices for each Throne Room effect. I love doing things like Throne Rooming a Steward so I can draw two more cards and then trashing two of the worst, or trashing two coppers and filling in with the +2 treasure. I caution you here: it’s very easy to get carried away with the Throne Room. But one of the ways this card is often misused is that it is overused. I’ve seen people buy up a sackload of Throne Rooms to play four or five of them on a single turn, just to burn pointlessly through their deck. These people tend to take excruciatingly long turns and overpurchase on action cards when they could easily purchase a slew of Provinces bringing the game to a much quicker and less painful (for the other player) end. This plan doesn’t always work; different strategies could easily surpass the annoying slow buildup to either gain an early lead that can’t be surmounted or to force the other player’s hand sooner. But seriously—I get it, it’s fun to use Throne Rooms with abandon, but try not to be a jerk. Play as efficiently as you can, even if that means winning by 8 instead of 22. (Not that you’ve necessarily done anything wrong if you win by a huge margin, and not that you should never hold back on buying a province. More on that in a later post). A series of cards provides the ability to trash a card, allowing you to gain a better one in its place. This is a great way to cull your deck slowly at the exact same time as you add better cards. It also works sort of like getting an extra buy, since you gain a new card without using treasure or buys to do so. And, unlike Workshop or Ironworks, you don’t get totally stuck when you don’t want a 4-cost card anymore. Moneylender and Salvager actually just improve your buy, which can be nifty. Use caution when buying these cards, though, as they tend to run out of usefulness, or go slowly when a similar deckbuilding feat could be performed much more quickly. For example, the Moneylender (turning a single Copper into a 1-time +3 Treasure bonus) is extremely useful early in the game, but becomes a dead card later on, when your copper is dried up or your deck is too big and doesn’t line up Moneylender and Copper at the same time. Remodel is super useful; but I’ve found it’s more useful later in the game, and less so early on. Never underestimate the power of the “gain a card costing 1 more than the trashed card” power either. First of all, that’s extremely useful for turning cost-5 cards into Golds when you need it; but you can also get rid of Curses or Coppers without having to gain anything in return. Forge is awesome. As is Expand. You do own Prosperity, right? Keep in mind alternate ways to use trashing cards as well. For example, take the Trading Post; a great way to turn those pesky Coppers into Silvers. But don’t forget, the Silver you gain goes straight to your hand, which means if you don’t have 2 cards you want to trash but you do have a Silver in your hand, you can effectively trash a single card by trashing your Silver with it – you’ll gain it right back. And with Forge, you can tag on Coppers with the rest of the cards you trash just to get rid of them. These are especially useful when the Hinterlands expansion comes into play; with the “when you gain” effects of many cards, you can start to chain actions together like crazy. And who doesn’t love grabbing an Ill-Gotten Gains card to send curses to your opponents, then Upgrading them into a Gold? Side note: the Feast card, while technically falling into this category, should be used sparingly. You should never buy a feast then use it to gain anything costing less than 5; otherwise, you should have just bought that original card in the first place. (in the same way, never buy a Feast if you have 5 or more treasure; just buy the card you’d trash it for). The only other real reason to use Feasts is as an extra buy; for example, near the end of the game you could trash Feasts for Duchies and still have your treasure to buy provinces. But that’s a weak strategy to rely on; so use sparingly. I love buying Farmlands, and then buying more Farmlands to trash them into Provinces. Well, that is it for today. In the next post, I will talk about key moments of the game, and how to help speed up your decision making (especially now that you’re familiar with all these card types and whatnot) during those times. We will get to attack cards, and then a summary post that brings all this together. And I’ll finish off this series with a few of my favorite cards and why they are my favorites. Until next time, meeples! Previous ArticleFDQ: How Long Do Your Games Stay on the Shelf?